The Design Lab: What is it? This year, the Grace community will experience a greater variety of amenities with the addition of the fourth floor and the lesser talked about design lab. You may be wondering, what is it? 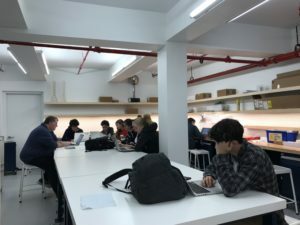 The design lab, also known as the “Maker Lab”, is a space dedicated to classes and clubs and independent projects of any discipline , but many are within the realm of STEM. Laser cutters and 3-D printers are just the beginning of the technologies that will become available in the space. Interestingly, the space where the fitness room was located in previous years, and where the design lab is now, was initially designed to be used for robotics, but the need for a fitness room presided over the design lab. All of the equipment is not here yet, so the space is not completely finished, but, when it is, the possibilities will be endless. Currently, some physics, advanced physics classes, DTC classes, as well as the robotics club and the science olympiad team are using the space. Those who take physics in the design lab are using the circuits, probes and counter space to supplement what they would do in their normal classes and labs. Robotics classes, on the other hand, are specifically designed for the space. High school classes are not the only ones using the space. 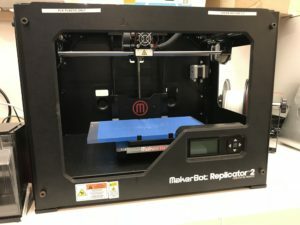 Already, the plan is in place for 7th and 8th graders to use the 3-D printers.